This high end notebook is considered the King of Hill in gaming notebooks, thanks to a muscled Intel quad core with 12 GB of RAM coupled with mid-range NVidea GPU with its own 3GB of video RAM. 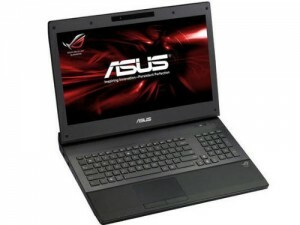 This Asus ROG model is at the top of its class and is considered the King of the Hill among the brand’s gaming notebooks, if not in the entire gaming market. Anyone interested to know what a $1,699 notebook is about should read on. Amazon offers a couple of used ones at $1,010 each which is already the average price of many middle-of-the-road high-performing laptops in the market. This high performance notebook combines the gaming muscle only available from a quad core engine with a dedicated graphics engine. It sports a second generation Intel Core i7-2670QM clocked at 2.2 GHz with Turbo Boost 2.0, and NVidia’s GeForce GTX 560M graphic processor with its own 3GB GDDR5 video RAM. Together with a 12GB RAM upgradable to 16GB with its 4 SODIMM sockets, the G74SX scores high marks in 3DMark Vantage and 3DMark11 bench tests to make it the fastest notebook out of the box so far. The video card supports DirectX11 which ensures that gamers can play the latest RPG and FPS games like Battlefield 3, Skyrim’s Elder Scrolls V and Crysis 2 without the hiccups common in many less able notebooks. A sumptuous 17.3-inch full HD screen with LED-backlighting completes your gaming pleasure. With a native resolution of 1920 x 1080, you get full HD playback from a built-in combination Blu-ray ROM /DVD writer, while allowing you to maximize the settings of even the most demanding games on the market today. It evens comes with the ASUS Power4Gear Hybrid utility for power management and optimization that can extend your movie watching and gaming experience on a single charge of its 8-cell battery when all the other equally muscled notebooks in its price point have died down. We’ve found the cheapest deal available here. The ROG G74SX-DH71 boasts of a 1.5TB hard drive that runs at 7200 rpm. Data connectivity is served with WiFi 02.11 b/g/n, Bluetooth 3.0 and USB 3.0, along with HDMI connectivity. There’s a 2 megapixel camera, a digital array microphone, stereo speakers with advanced EAX 5.0 and an 8-in-1 data card reader. It comes bundled with a 64-bit version of Windows Home Premium, an external mouse and a backpack. It is covered with a two-year global warranty that includes a 1-year Accidental Damage Protection which comes in handy to repair or replace the unit should you accidentally spill water, drop it on the floor, or gets damage from electrical surges or a fire within the first year from date of purchase. The audio system may be from B&O which allows for clear crisp sound, but its placement above the keyboard make it a bit louder from behind than in front of the screen. In addition, its touchpad can be a bit quirky and sensitive like in most other notebooks. As a gamer, you are better off using an external mouse that goes with it.